The intraoral camera is an amazing diagnostic tool for viewing different angles in the mouth that cannot be easily seen with a hand mirror. The camera gives us the ability to view the entire mouth on a monitor so that we can get a closer look at any potential issues or problems that may arise and treat things before they get serious. 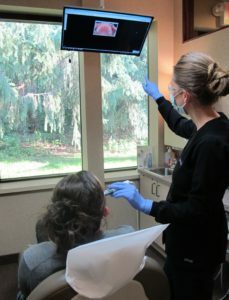 In addition, you have the ability to see for yourself first hand what we are seeing in your mouth.